A seventeen-year conundrum that baffled astronomers at the Parkes observatory in Australia has finally been solved. Once or twice a year, starting in 1998, researchers would see an odd signal coming from within about five kilometres of the telescope. They called them 'perytons' after the mythological animal. Originally it was thought they were linked to lightning strikes. But at the start of this year, when a new receiver was installed, strong signals were detected at a frequency of 2.4Ghz - the same as the one emitted by a microwave oven. The researchers immediately went to the staff cafeteria, and tested the oven there - but to their surprise they found no perytons. The hunt continued until someone had the bright idea of opening the oven door before it had finished cooking, as it takes a moment for the magnetron to shut off. "If you set it to heat and pull it open to have a look, it generates interference," Simon Johnston, head of astrophysics at Australia's national science agency, told the Guardian. 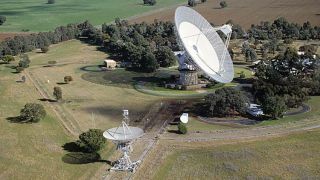 The observatory, which was used to relay signals from the Apollo 11 moon landing in 1969, has some operational staff but the astronomers who use it tend to work remotely. This disconnect, along with the fact that the interference only occurred when the telescope was pointed in the direction of the microwave oven, is what made the error so tricky to solve. Now, it can be detected and corrected - but there are more problems on the horizon for Parkes observatory. When it was built it was in the middle of nowhere, but urban sprawl has begun to surround the site and the increasing number of electromagnetic devices in everyday life is making it harder for the telescope to do its thing. To solve that, modern telescopes are built in "radio quiet zones". The astronomers reported the solution to their mystery in Monthly Notices of the Royal Astronomical Society.